It’s now a given that more people in their 60s and 70s are choosing to keep working. But a related trend rumbling beneath the surface isn’t so well-known: the share of working older people with full-time jobs has increased sharply – to almost 61 percent in 2016 from 40 percent in 1995 – as part-time work has become less popular. The majority of older Americans are retired. But among those who do work, the move from part-time to full-time is “a major shift” in work schedules, concluded the Brookings Institution’s Barry Bosworth and Gary Burtless and George Washington University’s Ken Zhang in a report last year. This is one aspect of the broader trend of rising labor force participation for the nation’s older workers. 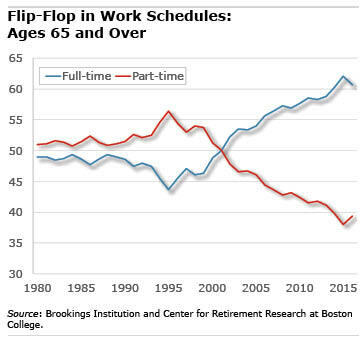 Burtless said in an email that the likely reason for the shift toward full-time employment is that more of the growing number of people who are working in their 60s and 70s are simply staying put in full-time career jobs. Not surprisingly, much more income for the entire U.S. population over 65 comes from work. In 1990, employment earnings made up just 18 percent of their income from all sources. By 2012, that had almost doubled to 33 percent, according to the Brookings report. Baby boomers can’t claim their full Social Security benefits until age 66, which is a year later than their parents. This reform also postponed the financial payoff from each additional year that Social Security benefits are delayed: a larger monthly benefit check. Traditional pensions, which give workers an incentive to retire as soon as sufficient credits are accumulated, are much less common today. In their place are 401(k)s, and many older people continue to work so they can keep saving for retirement. As older Americans have gotten healthier, the calculation of when to retire has changed in two ways. First, it’s easier for older people to continue working when they are healthy. Second, longer life expectancies put financial pressure on older workers – staying employed relieves some of the pressure, Burtless said. Not to mention the financial cost of living today verses when our parents retired. Inflation keeps going up but wages are stagnant and interest rates are still way too low. And the cost of health care and even insurance is mind blowing compared to even 10 years ago. The other factor is falling unemployment. We are heading for an economy I expected to arrive eventually. Plenty of jobs relative to the number of workers. But flat or falling wages relative to inflation because employers won’t pay up to fill slots. Because they can’t raise prices. Because their customers are broke. So instead there are all kinds of attempts to attract and keep workers without raising pay. Ping pong tables, more days off, work at home, and the like. Anything but higher pay. In this context, employers are going to have to turn to populations they might have shunned in the recent past: older workers, teenagers, etc. A major threat to retiring before age 65 and Medicare eligibility is the uncertainty regarding access to healthcare. The Affordable Care Act was a blessing for those of us who wished to retire before age 65. But now we can’t be sure that it will be here for us. I know that I have delayed my retirement so that I may continue to receive benefits and then can pay for COBRA coverage through my employer until I am Medicare eligible. I feel fortunate to have that option, otherwise I would be working even longer. I can’t help but feel that much of this is due to rising costs of living while wages remain more or less stagnant. The wealth gap keeps growing wider and the middle class is evaporating. Our parents could buy a home and support a family on a single income. Meanwhile, we can barely afford a one-bedroom apartment with the same salary. One reason wages are stagnant is they’ve been supplanted by increased costs for employers who still offer group medical and dental benefits. It would be interesting to see a study that reflected current costs of these totals combined. Frankly, I’ve never understood the value in treating benefits separately from wages when they both represent compensation. In my “reform” package, I’d solve the Cadillac tax debate by eliminating tax exclusion of all benefits, combined with a lowering of overall tax rates. To help balance the scales for those in lower wage brackets, lower or even eliminate payroll taxes as the Obama Admin. did as a temporary stimulus effort or offer a refundable general tax credit. These two steps could also cushion the blow for those about to get run over by current repeal and replace proposals. I am glad to see that older workers have more full-time work. So many older workers lost their jobs during the Great Recession, and found themselves “retired” before they anticipated. FT work is better than PT for paying the bills any day. Given the increasing longevity of Americans, it is smart to work longer rather than start to withdraw from your retirement accounts. Those retirement accounts need to fund our costs of living for 20 to 30 years after we hit age 66. Many older Americans have not done calculations (nor hired a professional to calculate for them), so they don’t really know if their retirement accounts are “up to the task” of supporting them for those many years. Working longer full-time is a great step for Boomers. It is one option among many to meet longevity’s (and inflation’s) challenges. In many countries, the retiring age is over 65 and many people work more than 40 years actually. You’ve mentioned a very important issue. Good stuff, thanks. It is good to hear that older generation people are staying healthy and working later. Usually after retirement they need to be taken care by their children. The trend of choosing to be employed full time even later in life is increasing. This is to be financially independent. If their health allows them to work, then I think it is a good change.